Rocket Motion Tackle Over Formation Series is great for youth football for several reasons. 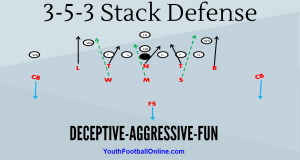 In youth football defenses will typically not adjust at all or they will over shift to unbalanced formations. The tackle over formation will give you more size at the point of attack and it will create an extra gap for the defense to account for. The Rocket Motion Series is a great series of plays that complement each other. If the defense wants to stop one play, they will set themselves up to get beat by another. On tackle over right, our LT goes and lines up outside of the the RT, tight-end lines up to the left. On tackle over left, our RT lines up outside of the LT, our tight-end goes to the right. This Rocket Series includes- Rocket Sweep, Belly, and Trap. In my opinion, Rocket Sweep and Belly are the perfect marriage. The Rocket Sweep will stretch the defense horizontally and make them adjust or get beat outside. The great thing about Rocket Sweep is that you only need to block 2-3 defenders in order to gain big time yardage. The Belly play will take advantage of defenses that are over adjusting or selling out to stop Rocket Sweep. Belly is a play that hits underneath the motion and will gut the defense inside when they widen outside. The trap play is a fast hitting play that will attack the interior of the defense. Center: Step play-side cut off the N.
Right Guard: Step play-side, reach and climb. Right Tackle: Step play-side, reach and climb. Left Tackle: Step play-side, reach and climb. Tight-end: Scoop or work to safety. 1: Toss the ball to the (3) outside, carry out fake. Toss needs to be out wide by the (LT). 2: Fake trap, work to second level. A good fake is needed. 3: Full speed rocket motion, receive toss, get outside. 4: Reach and climb, look to seal defensive end / outside linebacker. SE: Stalk block the cornerback. If the CB is playing press man, you can have the (SE) run off. This play is great because it attacks the edge of the defense very quickly and you only need to block 2-3 defenders to gain big time yardage. 1: Toss the ball to the (3) outside, carry out fake. Toss should be out wide by the (LT). 2: Off-set, lined up over the (RT), lead block, look to tunnel the cornerback. Motion player cannot go or lean forward until the football is snapped. The toss needs to be wide and outside, ball needs to be snapped when the motion player is directly behind the QB. Motion timing and snap count need to be adjust based on athletic ability. If the DE is really widening and not letting the play-side wing-back (4) seal him, you can have the (SE) crack a wide defensive end and have the (4) arch for linebacker. The (SE) and (4) are just switching responsibilities. The rocket toss needs to be practice often. Center: Step play-side base cutoff Nose Guard. If the center is getting double A-gap defenders the center is to block the backside A-gap defender. Right Guard: Pull and climb, kick-out the defensive end. Aiming point is the inside hip of the kick-out defender. Right Tackle: Gap-Down-Backer. If the center is having trouble with the N, or the N is slanting across the center’s face, the (RT) can block down on the Nose Guard. Left Guard: Step playside, cutoff. 1: Take snap, turn like it is rocket toss and hand to the (2). It’s important that the QB gets depth and doesn’t take any false steps to the backside. It’s the QB’s job to get the ball carrier the football in the backfield and at the point of attack. 2: Lateral step, come downhill, take handoff. The aiming point for the (2) is the inside foot of the (LT). We want to cut right inside of the (RG)’s kick-out. 3: Come in motion, fake rocket sweep. The motion timing is the same, the only difference is that he needs to fake like he is getting the pitch. A great fake is critical. 4: Insert for outside linebacker. SE: Stalk or runoff the cornerback. It’s important that the (RG) pulls and climbs. You do not want the guard to pull flat. If the guard pulls too flat and the defensive end squeezes, the guard won’t be able to kick-out him out. This will lead to the play getting spilled. Finish the block! A great fake is needed by the 3. Make sure he carries out his fake all the way, act like he caught the rocket pitch and he is running for a touchdown. QB must not take any false steps opposite of play-side. It’s the QB’s job to get the ball to the running back out at the point of attack. The ball carrier must never come to the QB for the handoff. This play is to be called when the defense starts to over-shift or overflow to the rocket motion. Have a coach watch the opposing defensive end or outside linebacker (depending on the defense you are facing) to see when they start widening in an effort to defend rocket. Right Guard: Double team N with the center, combo off onto the middle backer. It’s important that you get the nose driven back so you can just have the (RG) stay on the double team. Right Tackle: Block middle linebacker. Dip and rip, don’t get caught up or allow yourself to get launched on by a defensive linemen. Need a clean release onto the linebacker. Left Guard: Trap defensive tackle. It’s important that the Left guard pulls and climbs. The aiming point is the inside hip of the defensive tackle he is kicking out. Left Tackle: Work onto outside linebacker. Any defensive linemen or linebacker outside of him will be influenced by the rocket motion so we don’t need to block them. Tight-end: Block down, basically he is replacing the pulling guard. He needs to fill the void left by the pulling guard. 1: Take snap, hand to the (2). The (2) aiming point is right up the mid-line, so the QB needs to step off of the mid-line. 2: Take handoff, right up the mid-line, then cut behind the (LG)’s kick-out block. 3: Fake Rocket Sweep. A good fake is needed! Motion timing remains the same, just like it is Rocket Sweep. 4: Step play-side, reach and climb. We want it to look like it is Rocket Sweep. This will hold linebackers. When the QB takes the snap, he needs to open up and step off of the mid-line. In addition, the QB must gain some ground into the backfield so that he can hand the ball off to the (2) 3 yards into the backfield. This will give the (2) more space and time to adjust his path when he takes the handoff. A good Rocket Sweep fake is needed! This is a great play that will take advantage of penetrating defensive tackles. The double team between the (C) and (RG) needs to be good. If you can’t get the N driven back he may blow up the play. The reason we want the handoff to occur in the backfield is because if the double team isn’t moving the N, this will give the (2) more time to adjust his path. The Rocket Motion Tackle Over Formation Series is a great family of plays that work very well on the youth football level. They aren’t very difficult to install and they will give your offense a structured attacked. These plays all complement each other, while the unbalanced formation will create alignment conflict for the defense.